It has been said about many a punk bands, that they always sound better live than they do on disc. Well, Hermosa Beach's Pennywise is no exception. A loud band capable of exploding on album, it is their live show that has held fans in awe for so many years, and which has kept them coming back. They've delivered some great studio moments and some less-than-memorable ones, too. 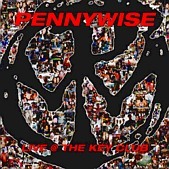 And though Live @ The Key Club doesn't come close to allowing you to really experience Pennywise live, it takes a good crack at it and delivers a sweaty, punk-intense set of the hardest pop-punk you could imagine.